WASHINGTON, DC, April 5, 2015 (ENS) – The neonicotinoid insecticide clothianidin is a likely contributor to monarch butterfly declines in North America, finds new research by a team from the U.S. Department of Agriculture. 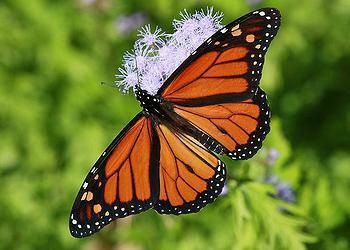 Theirs is the first report of neonicotinoids affecting monarchs or any other butterflies. The research, published on Friday, identifies concentrations of clothianidin as low as one part per billion as harmful to monarch butterfly caterpillars. These concentrations of clothianidin were found in the populations of milkweeds sampled by the researchers. 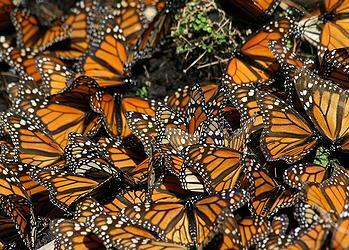 Meanwhile, a Texas A&M University researcher says reports by the World Wildlife Fund, private donors and Mexico’s Michoacan state show that Monarch numbers will be down almost 30 percent in 2012 as they make their annual trek from their breeding grounds in Mexico and move across Texas. Craig Wilson, a senior research associate in the Center for Mathematics and Science Education and a long-time butterfly enthusiast, says the figures show an alarming decades-long decline in their numbers. “The latest information shows that Monarchs will be down from 25 to 30 percent this year, and that has been part of a disturbing trend the last few years,” Wilson warns. Chip Taylor, director of Monarch Watch at the University of Kansas, estimates that 100 million acres of land have already been lost that previously supported Monarchs. Use of neonicotinoids increased in the mid-2000s, driven almost entirely by the use of corn and soybean seeds treated with the pesticides, according to researchers in Penn State’s College of Agricultural Sciences. “Previous studies suggested that the percentage of corn acres treated with insecticides decreased during the 2000s, but once we took seed treatments into account we found the opposite pattern,” said Margaret Douglas, graduate student in the Penn State Department of Entomology. “Our results show that application of neonicotinoids to seed of corn and soybeans has driven a major surge in U.S. cropland treated with insecticides since the mid-2000s,” Douglas said. Other research has suggested that neonicotinoids may harm pollinators, prompting their suspension on bee-attractive crops in the European Union and expediting their review by the U.S. Environmental Protection Agency. After discovering that neonicotinoid seed treatments were not documented explicitly in U.S. government pesticide surveys, the researchers synthesized available information to characterize the use of these widespread insecticides. First they compiled pesticide data from two public sources, the U.S. Geological Survey and the U.S. Department of Agriculture, that both reported aspects of neonicotinoid use, but did not estimate seed treatment use. Using these data, together with information from insecticide product labels, the team estimated the percentage of land in corn and soybeans in which neonicotinoid-treated seeds were used since these products were introduced in the mid-2000s. The team found that in 2000, less than five percent of soybean acres and less than 30 percent of corn acres were treated with an insecticide, but by 2011, at least a third of all soybean acres and at least 79 percent of all corn acres were planted with neonicotinoid-coated seed, constituting a significant expansion in insecticide use. The researchers also found that the vast majority of neonicotinoids are used on crops, rather than in people’s homes or gardens, or in turfgrass and ornamental settings. In February, the nonprofit Natural Resources Defense Council accused the Environmental Protection Agency of dragging its feet on efforts to save the imperiled monarch butterfly and filed a lawsuit to force the agency to act. EPA’s failure to respond to an urgent petition that sought to limit the use of another chemical, the herbicide glyphosate, that has been destroying monarch habitat, filed more than a year ago by NRDC, has resulted in “significant ongoing harm” to the vulnerable butterfly population, claims the suit, filed in the U.S. District Court in New York City. “The longer EPA delays, the greater the risk we could lose the monarch migration,” said Dr. Sylvia Fallon, an NRDC scientist and director of its Wildlife Conservation Project. The monarch butterfly, an iconic North American species that makes a unique 2,500 mile annual migration from the mountains of central Mexico to Canada and back, has been in decline for 15 years. Once numbering as many as a billion butterflies, only 56.5 million Monarchs were counted in January at their Mexican refuge, the second lowest total ever.